Logan Crime Writers ... L to R. Andrew Girle, Debbie Kahl, Jan Mills, Maggie Anderson and me ... Arms and Camera courtesy of Griffith Thomas from The Reporter. This photo shot by Gail Law. Smile! Say Logan Crime Writers! A Newspaper photographer from The REPORTER arrived at the Hyperdome Library to shoot the Logan Crime Writers, a subset of the new Logan City Writers collective. Every third Saturday, Logan Crime Writers conspire together at the Hyperdome Library, Logan City. Our group has gone from strength to strength since we began critiquing each others writing, a necessary ingredient in the growth of a writer. At the moment, our numbers have peaked to full capacity. Andrew Girle has almost completed his hardboiled Crime novel, No Working Title. Maggie Anderson has almost completed her Dark Fantasy/ Crime novel, Dark Legacy. Debbie Kahl is working hard on two Young Adult novels. Jan Mills writes Crime short stories and Junior Fiction. You’ll notice I was gripping Josh and the It, my kids Sci-Fi. Why didn’t I remember to bring my crime, Sayonara with me today? … Doh! … Its in the finishing stages atm. 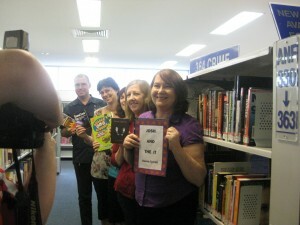 Whats the BEST part of being the Group Co-ordinator of Logan Crime Writers? … I’m part of this wonderful team of Writing and Crit buddies … and we’re all very supportive friends. The REPORTER will publish a story about Logan Crime Writers this coming Wednesday. Certainly a suspect and criminal looking bunch!! Hi just thought I would touch base as I have been off line for so long. Keep me posted in how things are going. Hi Karen, Lovely to hear from you again. I’ll keep you posted on whats happening … Cheers, Karen :)).